The easiest way to keep track of stuff you'd like to buy at some point is to use Amazon's default Wish List: it's the one that appears on product pages as a button, no need to click on a dropdown. Your saved-for-later cart is limited to 600 items, and all wish lists are limited to 2,500 items. So, sooner or later, you'll get the "List is full. The following item was not added. You’ve reached the maximum number of items (2,500) this list can hold" error message. There are two quick ways to create an Amazon wish list: from a product page, click on the dropdown arrow on the right of the "Add to Wish List" button, and choose "Create another Wish List" link at the bottom. 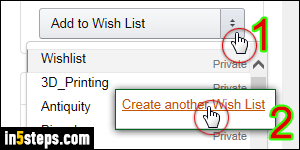 From anywhere else on the Amazon.com website, mouse over the "Wish List" dropdown (left of your cart, in the upper right corner), and pick "Create a Wish List" in the menu. In the Create a Wish List popup, the "List is for" dropdown shows "you" by default: click on it to create a wish list for another person (like a child). 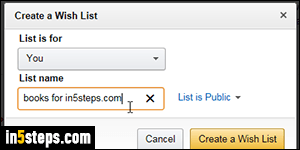 Type a meaningful label in the List name text box: when naming it, remember that Amazon automatically sorts your wish lists alphabetically. Adding a symbol (like an underscore) guarantees that the list will show at the bottom. You can rename existing lists to make them appear further down in the dropdown! 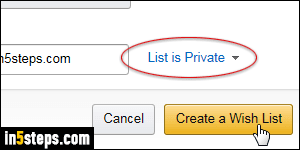 Following the "social" trend, Amazon makes your list public by default, meaning that anyone knowing your username or email address can look it up. You can also share a wish list with other account holders. To hide your list from everyone but yourself, just select private from the dropdown on the right. Now click on the Create a Wish List button to add it to your account. If you created a list from a product page, that item is automatically added to the list. 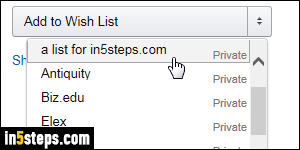 The new wish list is immediately added to your account: if you had a product page opened, and had already clicked on the wish list dropdown, you may need to reload the page to view your latest list (hit the F5 key on Windows / Linux, or Cmd+R on Mac OS X). I renamed my new list to make sure that it would appear near the top. To view the content of any list, mouse over Wish List in the top right corner of any page, and click on one of them: the largest lists show up first. To open another list, select "See More" from the dropdown menu!